"Two adventurers take on the world's harshest island!" At long last, Chris has finished the book about our four-year epic to cross Victoria Island, and it's been printed and is in stores now! 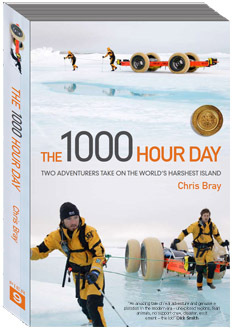 Not-surprisingly the it's entitled 'The 1000 Hour Day' and (packed full of more than 80 awesome photos, cool diagrams, maps and 362 pages of excitement) is published by Murdoch Books in Australia. 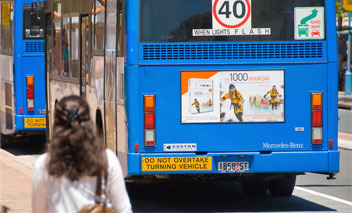 It's their 'lead title' for Christmas 2010, and is already recieving a LOT of attention - national TV interviews on 'Sunrise', hour long ABC radio national interviews, and is even being advertised on the back of busses! After a good day's hauling, at 5 pm we set up tent and I decided to go fishing. Ice-hopping out to deeper water, I started jigging the lure up and down in the crystal-clear water, expecting at any moment a silvery char to flash past and grab it. Glancing along the shoreline, I spotted a bunch of white rocks � or perhaps hunks of ice � scattered across the mudflats some 300 metres back along where we�d just hauled less than an hour earlier. I continued fishing. Scanning around as I idly flicked the rod tip up and down, I fixed my gaze once more on these white objects. I stopped jerking the rod. Were there more of them now? Were they closer? I stared at the motionless forms for some time before shaking my head, laughing at my own paranoia. However, just as I turned away, out of the corner of my eye I saw movement. Whipping around to stare, I watched transfixed as more and more white objects seemed to appear from nowhere and fan out across the mud. They must be caribou, I thought � they looked about the right size. There was something odd about the way they were walking though, they weren�t prancing or trotting as deer do, they were more ... loping along ... like huge dogs! My blood ran cold as I suddenly realised what was happening � I was standing there, with nothing but a fishing rod between me, and a pack of six, seven, eight arctic wolves, all pacing closer, and closer! 'CLARK!' I shouted. 'WOLVES!' Over 100 metres away, there was no movement from the tent, my yell snatched away on the bitterly cold wind streaming over the pack ice. The wolves heard me though, and stopped dead, all eyes on me, their ears as upright as the hairs on the back of my neck. Deciding I�d better get back to camp, I frantically reeled in my fishing line and moved to ice-hop back to shore. The moment I took a step, the whole pack started advancing as one. 'CLARK!' I shouted loudly every few paces, staring mesmerised at the multitude of wolves � clearly visible now � steadily closing the gap. 'CLARK!!' Finally reaching the shore, there was now nothing but 150 metres of mud separating me from the advancing pack, and panic lurched into my stomach. Trailer for our doco film 'The Crossing' - which you can buy now! THANKS VERY MUCH for buying through our website (rather than a bookstore), so I actually get some of the profits! NOTE: I'll refund postage savings on multi-book orders. OUR DOCO DVD HAS SOLD-OUT!!! 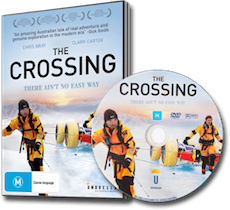 All 'The Crossing' DVD's have been sold! Award-winning, feature-length documentary following two young Australians, Chris Bray and Clark Carter as they set off on the adventure of a lifetime, attempting to drag their home made kayaks more than one thousand kilometres across a remote arctic island. WATCH THE TRAILER! 86min.